During the first week of November 2016, I met up with Ben Horne and Alan Brock, and a few other notable photographers such as Michael Strickland and Thomas Heaton. We went to photograph the annual display of fall colors in the park. 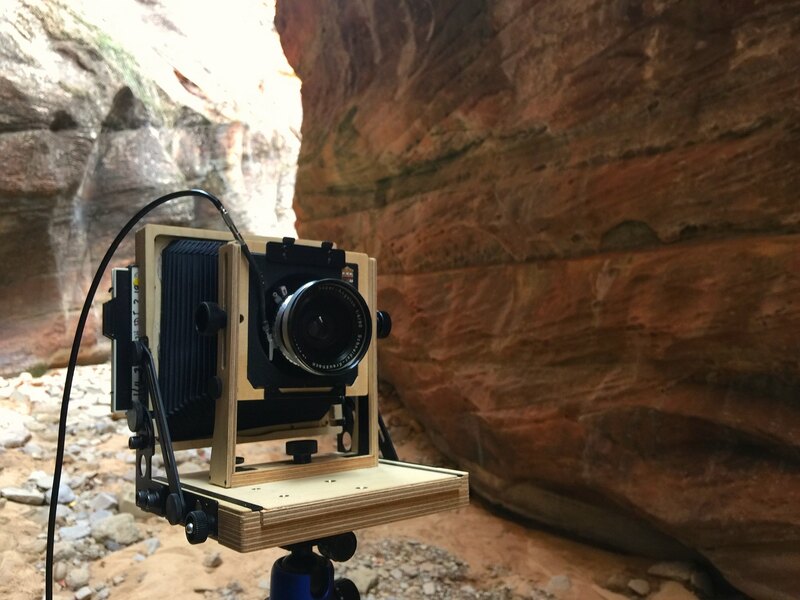 I brought the Intrepid 4x5 Field Camera as my primary camera for the trip. I parked my truck along the side of the road and set out into the landscape to seek out original compositions. As I rounded a bend in the wash, this maple immediately captured my attention, as it stood out starkly with its brilliant yellow leaves against the deep red sandstone wall in the background. 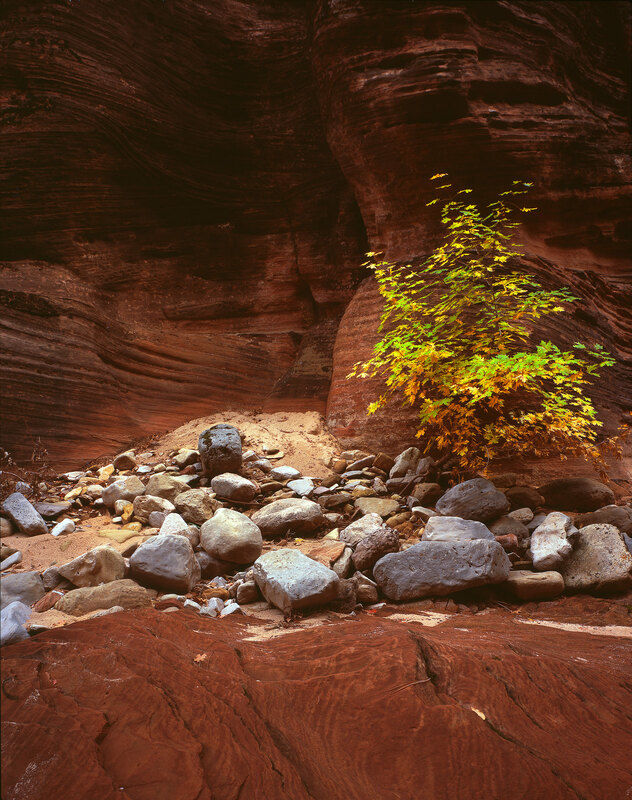 The fact that the tree had only half of its leaves remaining on the branches worked out so well, because it provided a bed of yellow beneath the tree amongst the bluish tones of the rocks and reddish tones of the wet sand. The scarcity of leaves also allowed the delicate shapes of the individual leaves to be revealed on the tree, where they would ordinarily be masked out by appearing a solid mass of yellow or green. I believe I may have caught this beautiful tree at exactly the decisive moment when it was at its very best look of the entire year. Later, as I explored this wash further, I kept staring at the ground looking at all the fascinating patterns in the mud ripples there. The wash had flooded a few days prior, and some of the sand was still wet, forming these gorgeous wave-like ripple patterns in the mud. 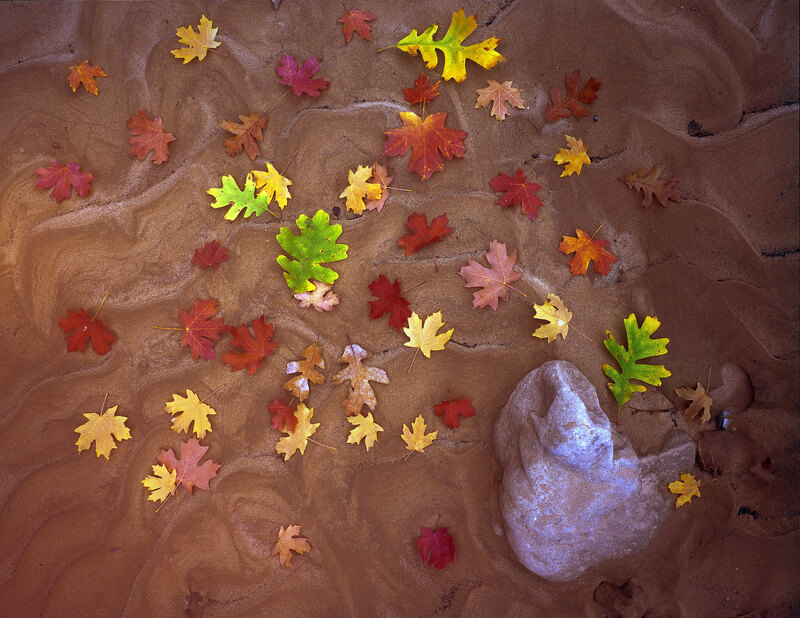 As the winds blew, colorful leaves from the numerous deciduous Maples, Oaks, and Cottonwoods growing on the hillsides surrounding the wash blew off the trees and flittered down to the earth, settling on and sticking to the mud ripples there. This formed a beautiful juxtaposition of vivid colors and shapes against the fascinating patterns in the mud. 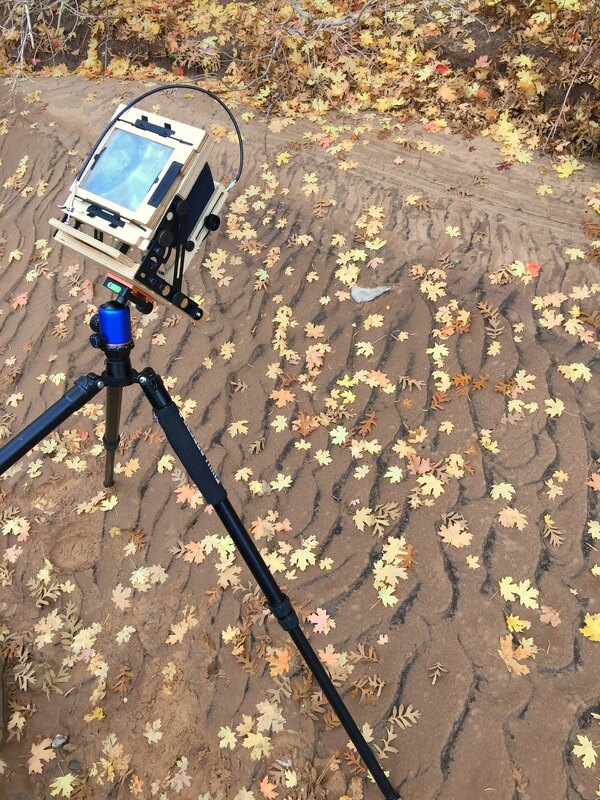 I set up my Intrepid camera pointing straight down, and gingerly leaned out over the camera, looking under the dark cloth to focus the image on the ground glass, all the time being very careful not to get my feet in the shot or make any footprints in the mud. As I made the exposure, it began to rain. These washes can be extremely dangerous in the rain, as potentially deadly flash floods are a fairly common occurrence there. So the moment I clicked the shutter, I quickly snatched up my camera, bag and tripod and scrambled up the side of the wash to safety to wait out the rain. On the second day of my trip, I spent the day exploring washes again. 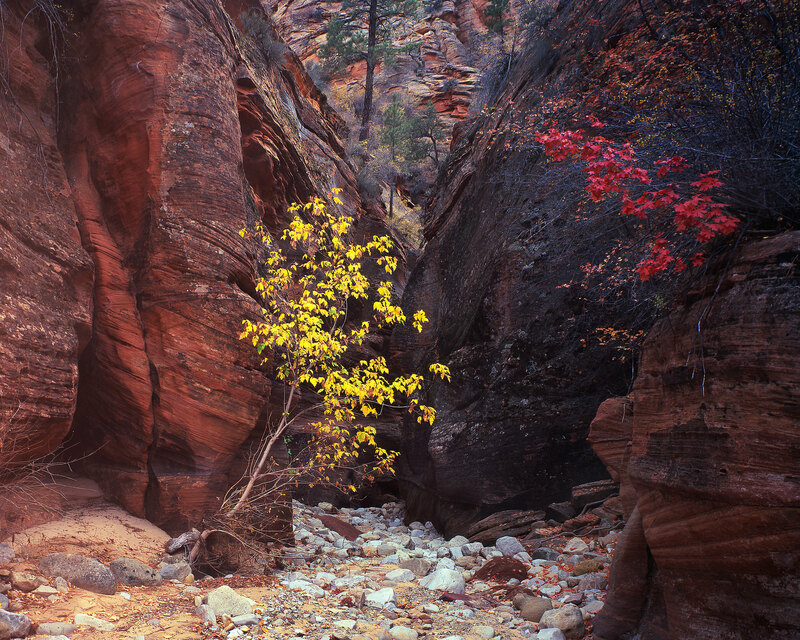 Towards the end of the day, I was exploring a narrow slot canyon section which was lined with trees in vivid autumn colors, when I came across this perfect pair of trees, the one on the left a Cottonwood in yellow, and the one on the right a Maple in red. 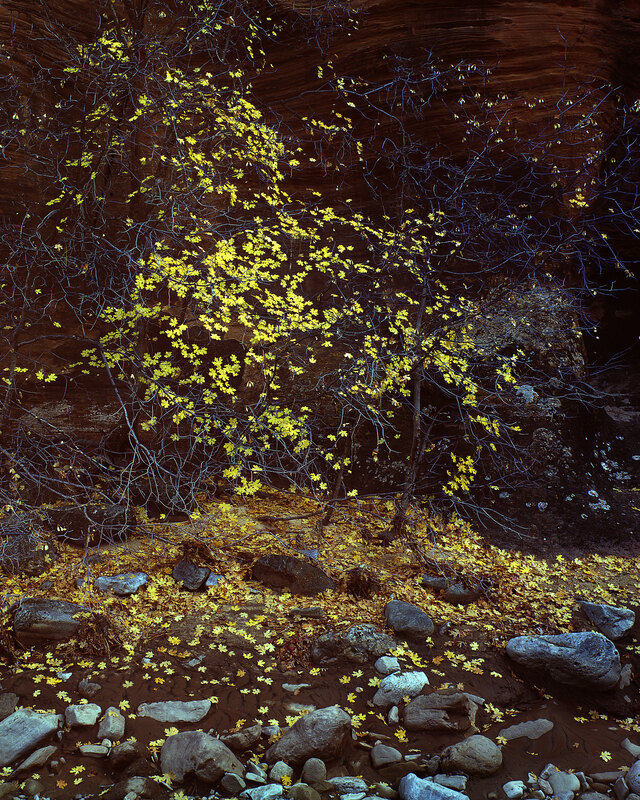 I set up my Intrepid camera and made one exposure on Fuji Velvia film. As I was about to trip the shutter, Thomas Heaton, an accomplished British landscape photographer who’s excellent channel I follow on YouTube, walked up. We exchanged pleasantries and then I got back to work and made the exposure. 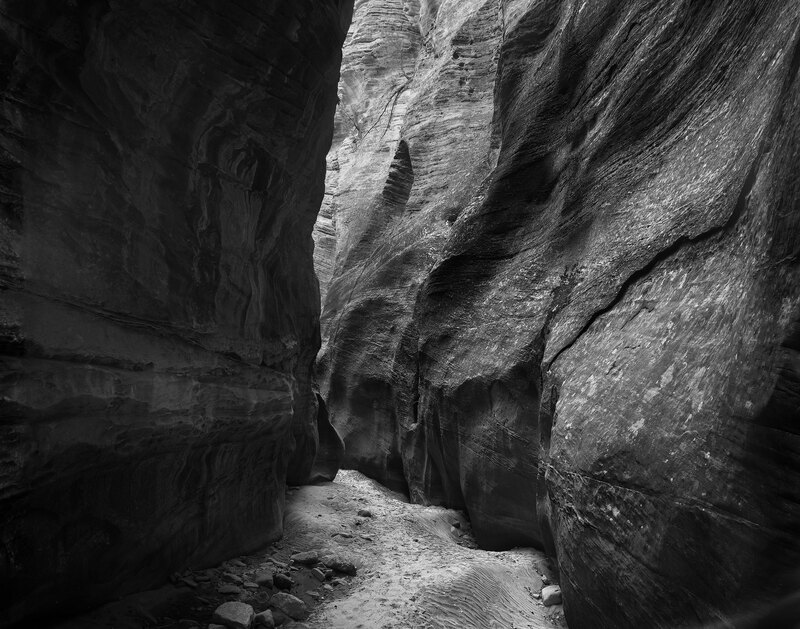 "beauty & life in adversity"
While I was in this section of canyon, I also made another exposure featuring a small maple sapling which had taken root inside of a rocky section of the slot canyon. It was amazing to me that such a small and delicate tree could survive in such a harsh environment, but there it was, adorned in the brilliant yellow coat of autumn color. 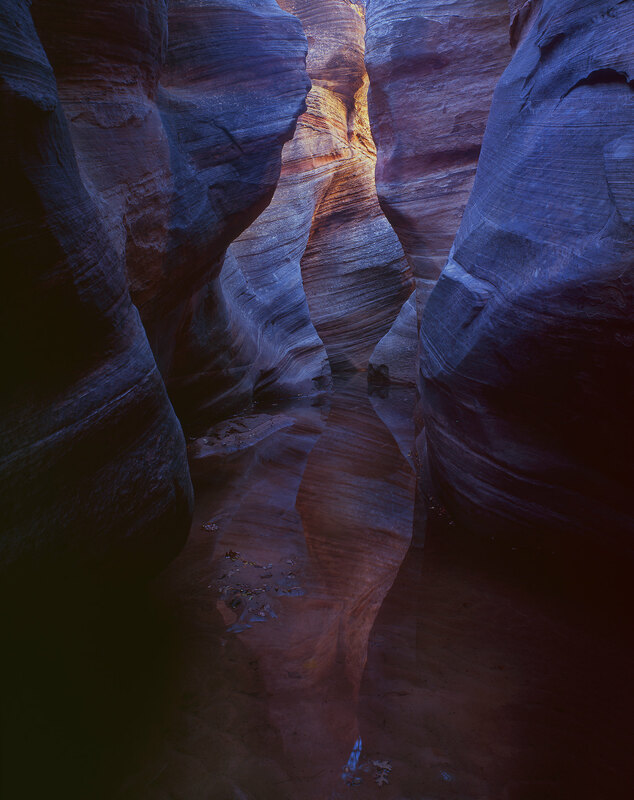 I made one exposure with my Intrepid camera backed up against the opposite wall of the slot canyon on Fuji Velvia which captured the soft tones and filtered light of this scene beautifully. 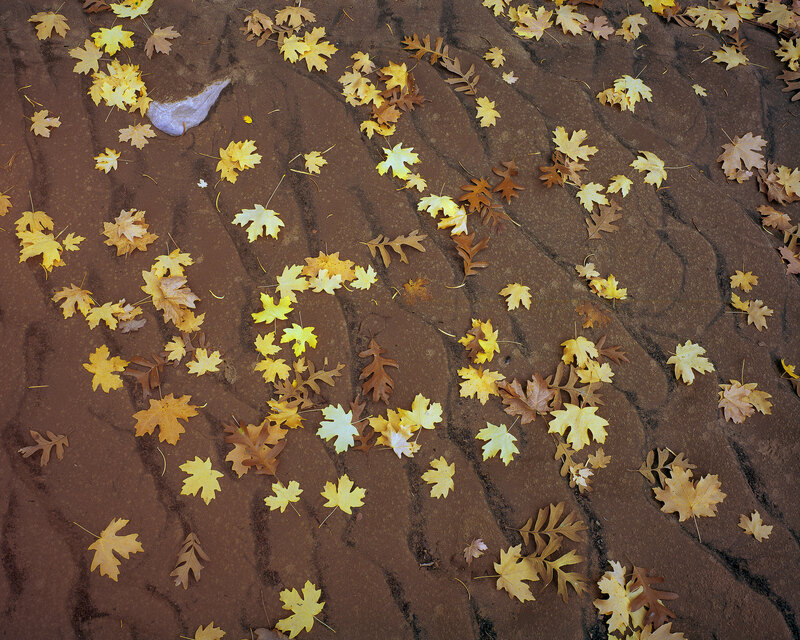 A few days later, I stumbled across another scene of fallen leaves on wet mud ripples, this one exclusively covered in maples on a darker mud, covering a larger area. I set up the tripod leaning against a large boulder behind me and again carefully focused the ground glass from above, capturing this exposure. I camped and photographed in this amazing park for 6 days. On the second or third day, I awoke to a strong wind and overcast skies. 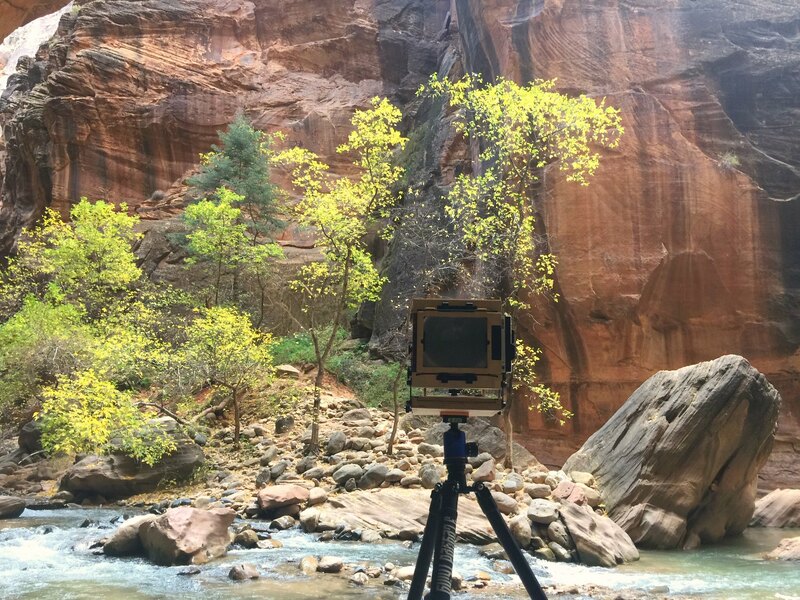 This made large format photography difficult, as most large format exposures are rather long, and photographing fall leaves while they are blowing around in the wind is nearly impossible. So I decided to make the best of the situation and spent the day exploring several of the park’s lesser known and seldom photographed slot canyons instead. I truly love photographing and exploring slot canyons, as they are one of my favorite geological features and photographic subjects, so this was a real treat. 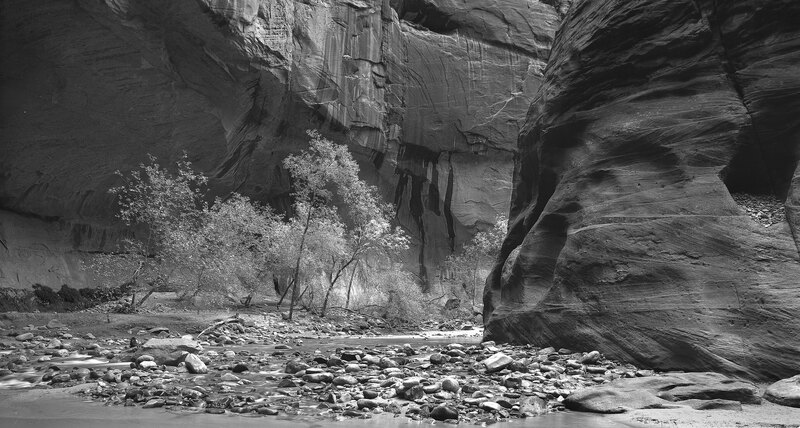 While it was overcast, I decided to use black and white film to highlight the beautiful textures and forms in the canyons. I made a couple of different compositions on Fujifilm Neopan Acros 100 black and white negative film. One was of a large canyon with a large ominous looking fracture in the rock on the right side of the composition, which I titled accordingly. The other was an image of a pristine section of canyon that I found still flooded and filled with deep water and soft mud. Not a single person had set foot in this canyon since the flooding had occurred, and it was a true joy to have the opportunity to photograph this special place in such a perfect state. 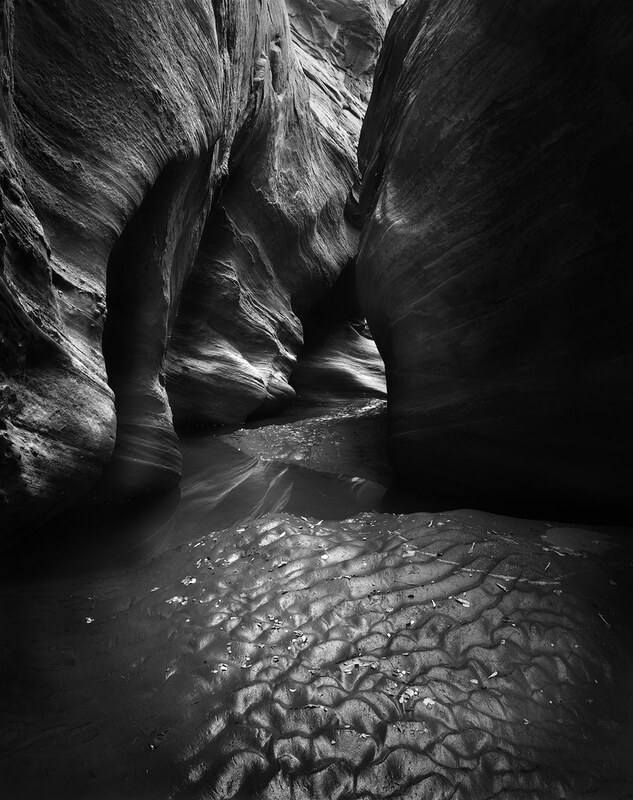 Late in the afternoon, I came across another flooded section of slot canyon that had not been touched by man since the flood had occurred, leaving it similarly pristine. 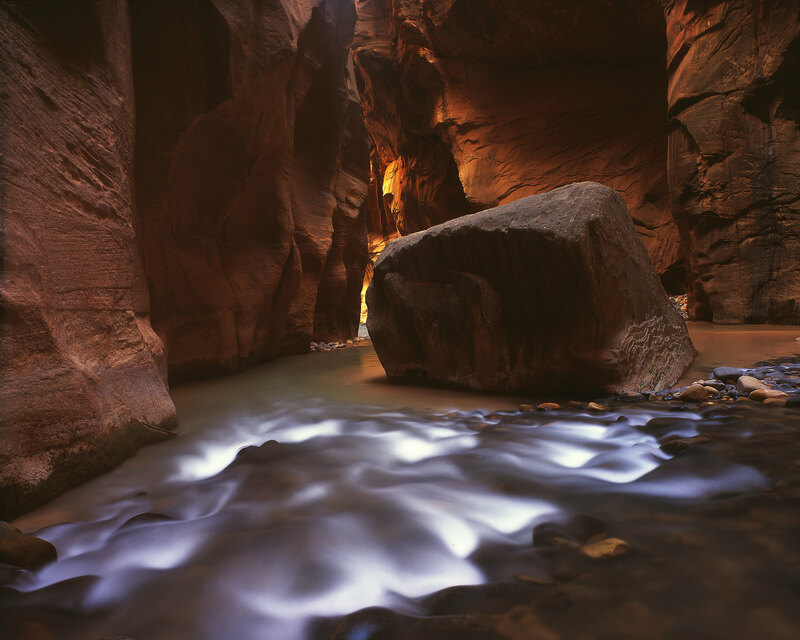 In this canyon, the water formed a perfectly still sheet of glass which reflected the canyon walls above perfectly. The sun was shining at this point, and it formed beautiful reflected light as the sun illuminated the highest areas of the canyon walls and the light ricocheted back and forth down into the depths of the canyon. By the time the light reached the bottom, the colors had shifted to deep purplish blue tones, contrasting with the warmer orange tones higher up and forming a beautiful contrast. I photographed this scene with my Intrepid camera on Fujifilm Velvia 100 color transparency film using my Schneider-Kreuznach 90mm ƒ/8 lens. 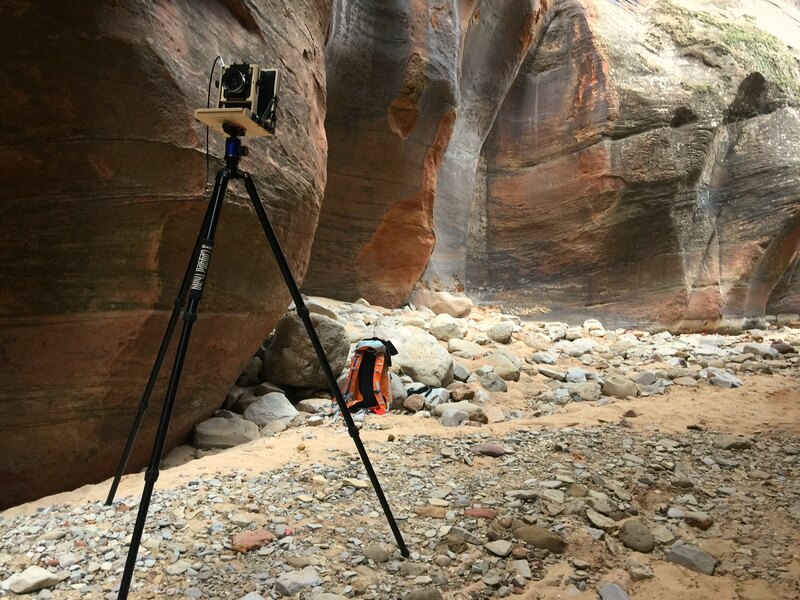 Later in the week, I awoke before dawn and suited up with dry pants and thick neoprene socks to spend the day photographing in the famous Zion Narrows. 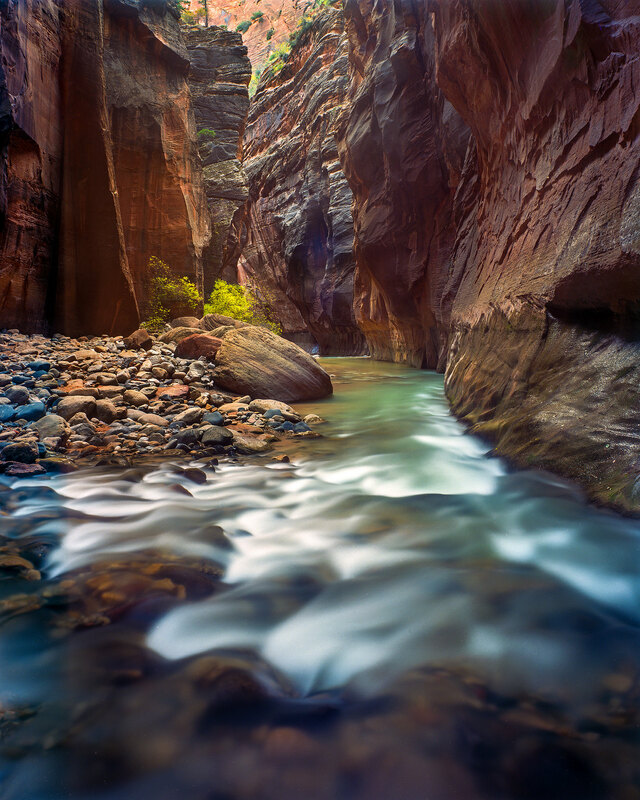 This is a well-known section of the Virgin River Canyon which contains a long and narrow slot canyon section that is over 1800 feet deep but only about 20 feet wide in places. It contains a section over 2 miles long with sheer vertical walls sandwiching the river between them, in which hikers must wade in the water for the full two miles without ever setting foot on the bank. This famous section is known as “Wall Street,” for its resemblance to the narrow city streets and high-rise buildings of its namesake. Later in the afternoon, when reflected light was at its peak for the day, I stopped for about an hour to photograph two famous scenes in the Wall Street section of the Narrows. The first scene was a composition I’d photographed back in 2013 with my DSLR, and I wanted to return to create a new version of the image on large format film. After waiting for the clouds to blow away and the sun to create the beautiful reflected light I was looking for, I finally exposed the frame of Fuji Velvia 100 color transparency film you see here. 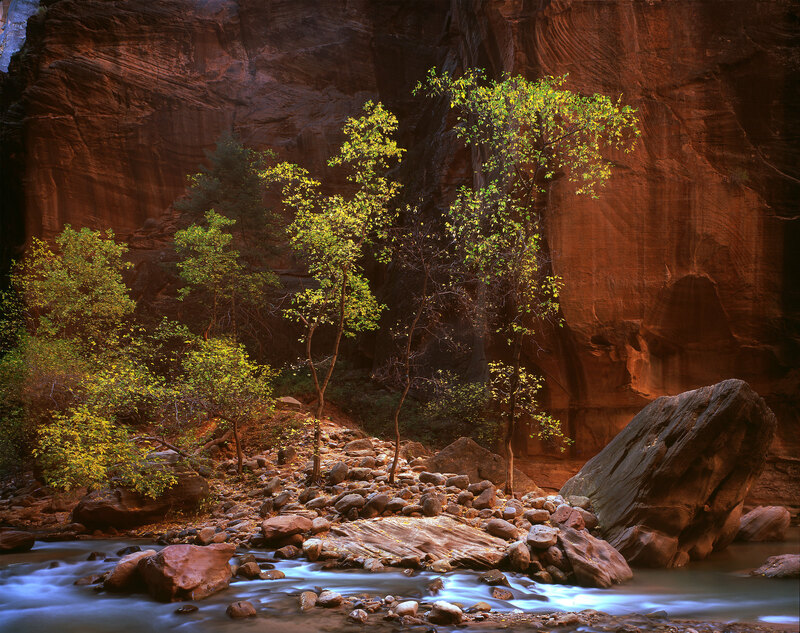 This boulder is known as the “Imlay Boulder,” and is one of the most photographed things in Zion National Park. I don’t claim this to be an original composition, though ironically the first time I photographed it I’d never seen any other image of the boulder before! I suppose this composition is a rather obvious one, but it is strikingly beautiful nonetheless, and I was happy to be able to replace my earlier digital image with one displaying the strong aesthetic character and supreme image quality that we love so much about large format Fuji Velvia film. I also captured this scene on Kodak Ektar color negative film, but I liked the compressed dynamic range and more vivid colors of the Velvia better when I got both film sheets back from the lab, so I chose to use the Velvia version. The second composition I made on my way out of this area was of a scene I’d seen made by a couple of other photographers, but most notably by Alan Brock. Again, this composition was not original by any means, but the scene was strikingly beautiful, and I did not want to miss the opportunity to capture its beauty on large format film at least once! 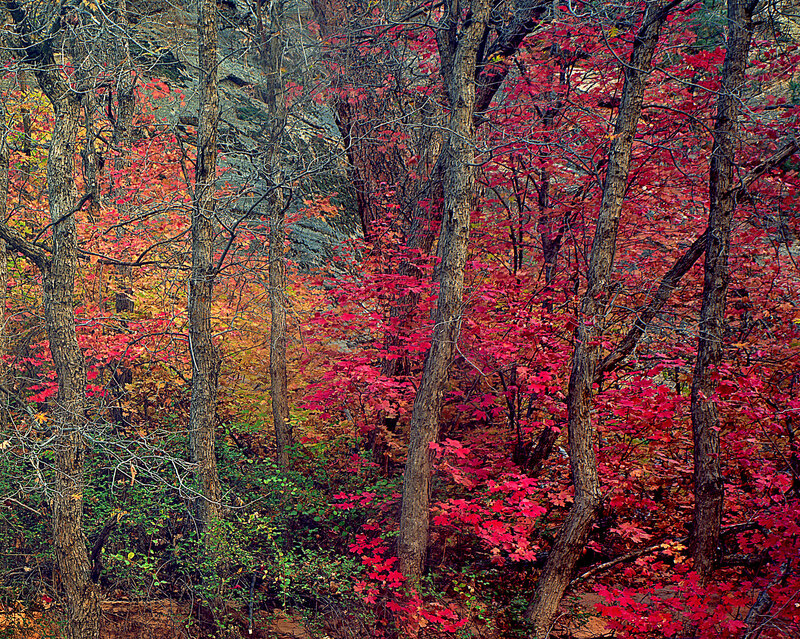 I set up my Intrepid camera and made one exposure on Kodak Ektar 100 color negative film, which you see here. By this point, I’d run out of Velvia film and was on my last sheet of Ektar. As the light began to fade, I made my way out of the Narrows for the day. As I passed through the “Paradise Cove” section of the Narrows, I noticed the reflected light was at its peak in this section of the canyon. This scene would have been perfect to capture on Fuji Velvia film, but unfortunately I was fresh out of not only the day’s packed supply of Velvia but also all of the Ektar, leaving me with only Fuji Neopan Acros black and white negative film. I decided to make one exposure on the black and white film because the scene was truly magnificent, and I figured it would be better to have it on black and white than not at all! Besides, there are numerous images of this scene in color all over the internet, but very few in black and white and even fewer on large format film. On the evening of my last day in the park, I set out into some washes I’d not yet explored, seeking out remaining pockets of fall color after the recent winds had blown away most of it from the park. As the sun began to set, I ran into both Ben Horne and Michael Strickland, two incredibly well accomplished large format photographers, in the wash. We walked through the wash together and found this colorful stand of trees adorned in peak fall colors. We each made exposures, spanning 4x5, 8x10, and 617 film formats. Despite standing beside one another, all our images came out differently, thanks to diverse personal visions, and the differences between formats, focal lengths and film stocks. This cornucopia of variety is one of the many things I love about shooting film! I captured my version of the scene on my very last sheet of Kodak Ektar 100 color negative film, as I’d run out of Velvia completely for the trip! In conclusion, throughout the week, the Intrepid Camera was very light on my back, and did not impede my ability to comfortably and safely hike, maneuver and explore in the backcountry in any way whatsoever. I could not tell the difference between this large format system and my old 35mm DSLR system when I was carrying it, and this is an incredible accomplishment for a large format camera! The Intrepid Camera’s incredibly light weight and supreme simplicity were a valuable asset to me as I worked in the field all day on each day of the trip. It allowed me to focus on enjoying my hikes through the beautiful scenery, and to capture these scenes as I pre-visualized them using an excellent range of technical movements. The images this camera captures showcase the extreme detail and beautiful tonality of large format films, and the camera is a pleasure to work with. I look forward to putting the Intrepid Camera to work on many future trips! You can view more of my work with the Intrepid Camera, along with behind the scenes videos and updates from my adventures by following me on Instagram at @lowerylandscapes, on Facebook, and on my blog and email newsletter at http://lowerylandscapes.com.